For many years my wife nagged me to take up yoga. No, I said, it’s just a lot of gentle stretching for girls. Then, about five years ago, I tried my first yoga class. If I had known then what I know now – that yoga is the hardest, most gruelling physical exercise known to man – I would never have started at all. By the end of the first class, I was a physical, mental and spiritual disaster zone. I could comprehend very few of the postures and could do almost none of them. Every muscle in my body hurt (even muscles I never suspected I had), my brain was reeling with shock and humiliation, and I realised with horror that I was worse at yoga than the worst person who had ever tried to do it. At the end of the class the teacher looked me up and down and told me not to expect any kind of improvement for at least three months. She was right. I did not improve for at least three months. But I stuck at it, and after a year I realised something remarkable. I had improved, ever so slightly. Now, five years later, I have improved ever so slightly more. I am no longer the worst person in the world at yoga. Over the years I’ve had several yoga teachers, although I now understand that this is in fact an illusion. They are all just different manifestations of The One. 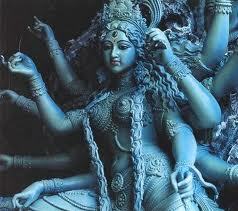 For that reason – and for heightened dramatic effect – I will refer to them interchangeably as the Goddess. This version of the Goddess speaks with a trace of a Russian accent and goes by the name of Milena. But I am not fooled. I have also tried different styles of yoga, including the hardest of all – astanga yoga, which is a cross between gymnastics, kick-boxing and marathon running. And here’s something else I’ve learned about yoga. Almost entirely, women do it. I am often the only man in the class. The thing is, yoga was invented by men for men. For thousands of years women were forbidden to practise yoga or even to learn about it. Then some idiot let the cat out of the bag, and now look what’s happened. Women everywhere. Trying to find a man doing yoga is like trying to find a woman who can change a spark plug. This is me, doing my best to blend in. In this class, the Goddess manifests herself as Viktoria. When I am tied in a knot, trying to do what the Goddess commands, I wonder if yoga is a metaphor for the changing world order. First there was feminism. Then post-feminism. Now this. Post-masculinism. The descent of man. Men were given our chance to rule the world and we blew it. Instead of solving third world poverty and promoting world peace, we spent our time watching football and drinking beer. Now it’s the women’s turn. They can surely do no worse. Definitely not just gentle stretching. In this guise, the Goddess calls herself Reema. Men are becoming redundant. Our role has already been marginalised. Now we are needed only to work and to procreate. Soon, advances in science will take even these basic functions away. Robots will do all the work, and babies will be manufactured in test tubes or something. Men will be obsolete and might be disposed of completely, or just kept for entertainment. Women will take their place as rightful heirs to the world. There will be no more aggression, violence or warfare. Just gossip, jealousy and bitching. And yoga. This entry was posted in Yoga and tagged Feminism, Health, Humour, Philosophy, Yoga. Bookmark the permalink. I had a yoga DVD to follow but never did. I am horribly unbalanced and find myself having great difficulty. I also suffer from short term memory issues as a result of a mold and mycotoxin exposure. I really need someone to work with me rather than try and do it from a DVD. I also have all tile floors and can’t use the traditional yoga or exercise mats because of the chemicals. I commend you for doing it and sticking with it. I know it would help me tremendously. I love yoga. It’s a really good all-round exercise, and can be as energetic (or not) as you choose. There are different styles of yoga and the best for beginners is traditional Hatha yoga. I would definitely recommend finding a yoga class instead of a DVD. Doing yoga with just a DVD could go horribly wrong! Most yoga mats are synthetic, but other types are available. Mine is an “eco mat” made from rubber. Thanks Carol, making people smile is all I am hoping to do 🙂 I plan to continue my yoga classes, especially since I have no idea how to change a spark plug. Ha! I love it … as well as the follow-ups. Nice. ‘There will be no more aggression, violence or warfare. Just gossip, jealousy and bitching. And yoga.’ Ha ha another great line. 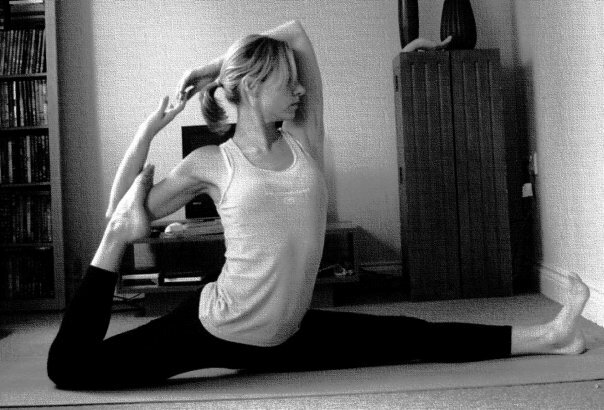 In Ashtanga there are lots of men, they have not being driven out. Do you practice at home at all? Yes, I practise most days at home. That way I embarrass myself only, not others. I also do an Astanga class once a week. Do you do Astanga?